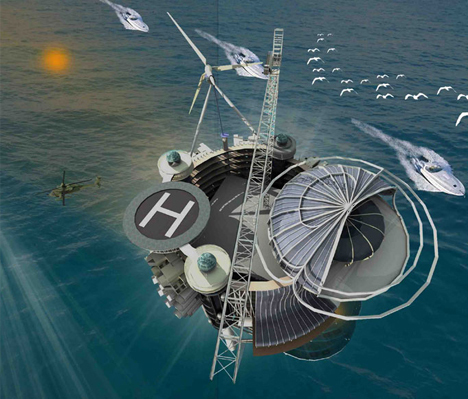 SAEBA.COM: Recycled Rigs: Abandoned Oil Platforms as Ocean Mini-Cities? 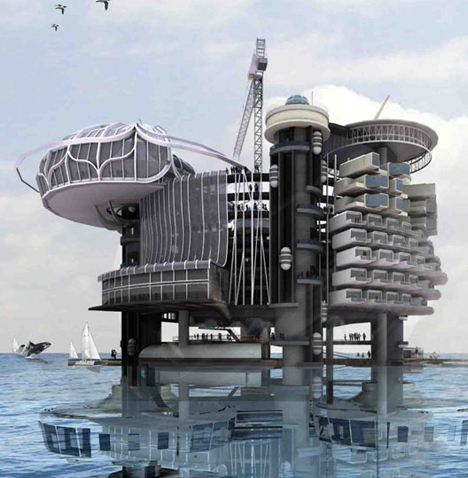 Recycled Rigs: Abandoned Oil Platforms as Ocean Mini-Cities? It is hard to believe that there are companies capable of creating (relatively) robust structures far out at sea, (usually) capable of withstanding extreme weather and lasting for decades or longer. But their use in harvesting ‘black gold’ from the ocean floor is limited, as alternatives are (hopefully) developed and spill risks increasingly recognized. Here is one vision for how one turn such relics into semi-submerged habitats and give them a new architectural lease on life. 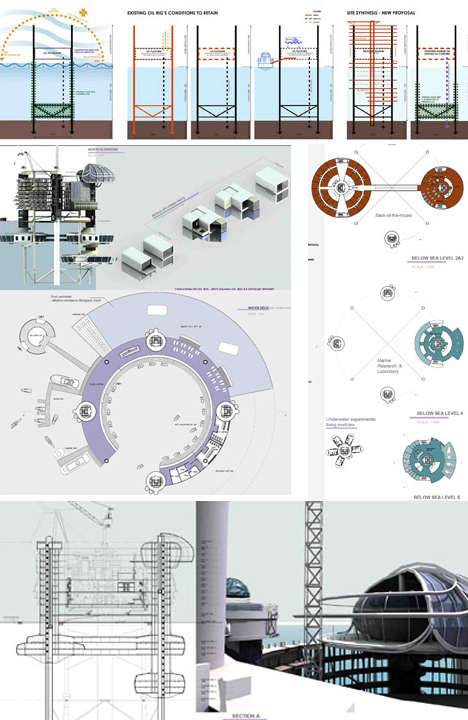 A competition entry by Ku Yee Kee and Hor Sue-Wern of Malaysia for Evolo, this idea is speculative, creative and additive – it is more about exploring various possibilities than creating a resolved design. 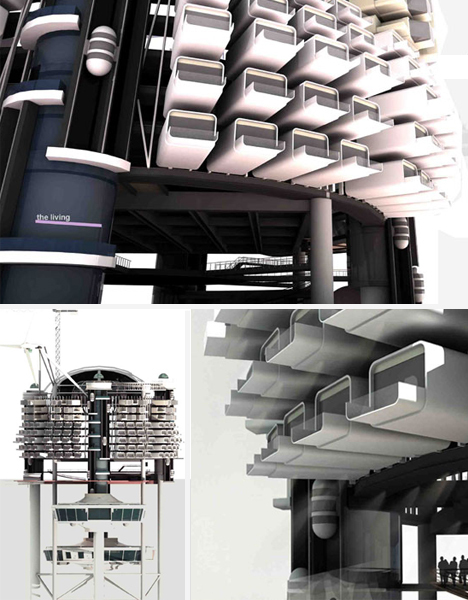 Still, the latter seems to result from the former, with many metaphorical as well as physical levels spanning from lofted surface layers to submarine science and observation stations. 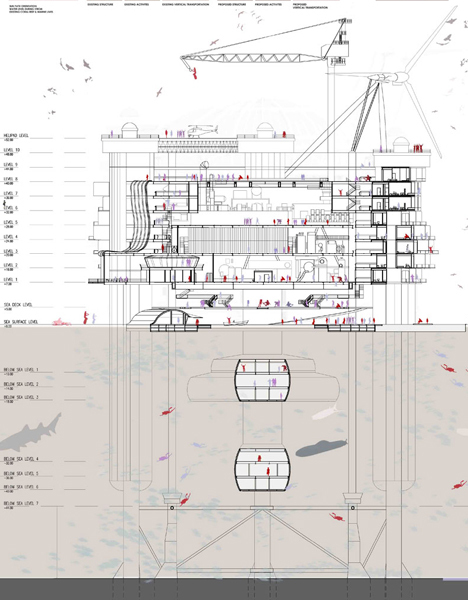 Much like a skyscraper or other self-contained mega-structure, the program works from the inside out; core service, conveyance and community functions exist in the structural core, while residents of each modular village are arrayed in dwellings plugged in around the outer rim, affording ideal vistas of the surrounding seascapes. 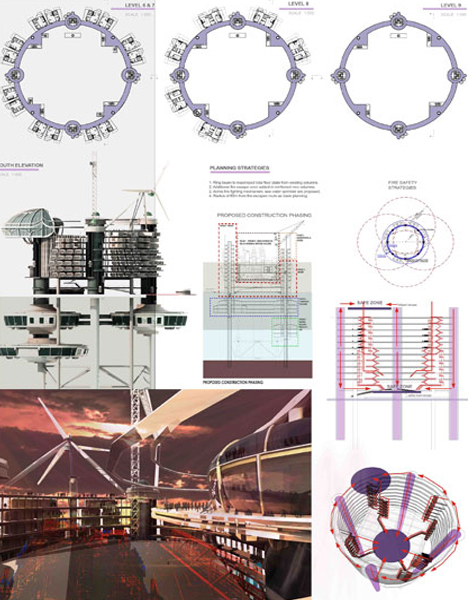 As intriguing as the final renderings are, the process models, sketches and diagrams are at least equally fascinating – they show a series of related and independent thought processes, three-dimensional experiments and sources of inspiration leading up to finished drawings and perspective money shots. The standard solar and wind power generators are present, but tidal energy is also available given the relatively unique placement of these would-be water towns. 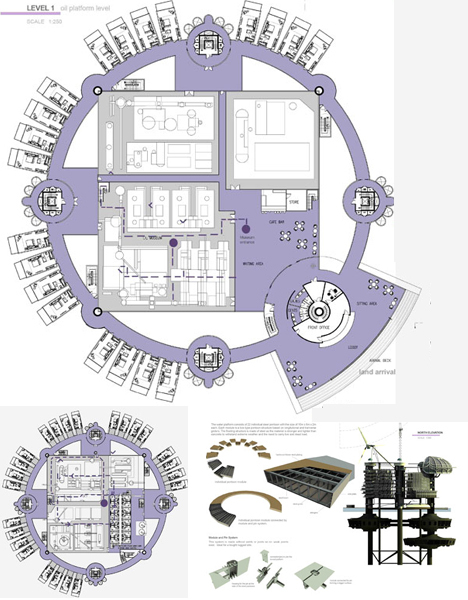 Each atoll would, in theory, be at least largely self-sufficient, assuming some space were provided in the final design for growing fruits, vegetables and perhaps selectively raising a little supplemental livestock.